Pain is a sensation which all cyclists experience, the familiar warm sting in the legs and dry rasp in the lungs as we push ourselves beyond our comfortable limits looking to go faster or farther. But when does a healthy sting turn into a damaging throb? 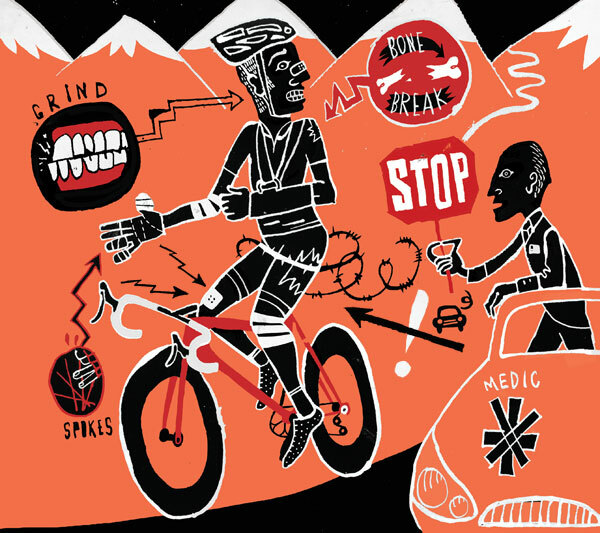 We take a look at pain, when you should toughen up, riding on and when to ease off, preventing injury. What is pain: Pain simply put is the body’s warning system which tell us that the activity that we are doing is causing some sort of damage. Nerves transmit these warning signals from the area being damaging to our brains. Through evolution we have developed this system with the unpleasant sensation felt aimed to make us stop what is causing the pain and learn not to do the same in the future. As we know, this system is triggered when riding hard and pushing our bodies to their limits. Naturally the body does not want to do this because of the potential damage to cells and also the loss of stored fuel, wanting to survive during a time of starvation. Through training we learn to block out pain, to a greater or lesser degree, if we always listened to these signals then we would never progress as riders. By becoming more resistant to pain means that we can ride harder, but also means that we can become at risk of pushing too hard and causing injury. To prevent this risk it is necessary to differentiate between the different types of pain, knowing how they feel and how to act accordingly, see box out. Visceral pain: this is a dull pain sensation which is hard to locate and comes from pain receptors found inside our muscles and organs. It is often caused by inflammation of a certain area of the body. When looking out for this think of the dull ache experienced after a hard ride, caused by muscle damage as a base, up to a throbbing when you have a very bad bruise, normally rhythmic with your heart beat. Superficial pain: this is a sharp stinging pain coming from the more sensitive pain receptors found near the skin. This is normally as a result of injury to the skin, either from a cut, burn or abrasion. When looking for this type of pain think sharp scratch incurred when having an injection, up to the cold numb feeling of a deep cut which is soon followed by the sharp and easy to location pain as the air touches the nerve endings, think road rash. Deep Somatic pain: This is a very deep, nausea inducing pain coming from receptors on bones, ligaments and tendons. It is normally associated with breaks, sprains and tendon damage. When looking for this pain think the deep, dull pain caused by a twisted ankle or pulled ligament, up to the stomach turning pain of a broken bone. 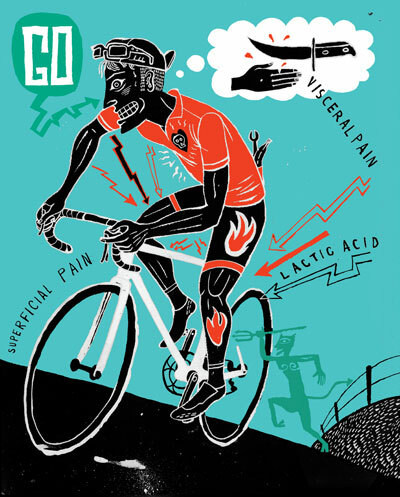 How is the cycling pain classified ? The warning signals which we experience whilst cycling are a combination of superficial and visceral pain. With its effort, working the body close to its anaerobic threshold, cycling has a hot pain from the build-up of lactic acid, superficial sharp pain, which then turns into a visceral pain caused by the muscle damage and consequent swelling. The more we ride the more we know how this type of pain feels. This is a pain which we can cope with and still push on. Anything different to this which is a new type of pain and very localised is a pain which you should not man up against because this is the pain associated with injuries. Being able to see the different sensation from the different types of pain is the key to not causing injury. Rather than the body screaming “stop because I might pass out from this dull, stomach turning pain of a broken bone”, it is screaming “stop because of the hot pain from the lactic acid building up on the muscles”. The pain from riding will continue for a short period after the exercise has finished because lactic acid is still present in the body, but as soon as the body starts to neutralise this the pain will ease, as the body recovers. If serious damage has been done the pain experienced will be much more specific to the area damaged and the motion which is causing the damage, once this is stopped the pain will ease considerably. Knowing what pain and sensations to look out for whilst riding is the key to reducing your chance of injury. If, when riding you feel anything which is different to the normal sting through your whole body from the effort, then it is wise to stop and if you crash, feeling deep somatic pain, then it is really the time to throw valour at the window and stop riding. It is certain that if you decide to continue on and zone out the pain great damage will be caused. Frank Loic, Team Doctor for French Team Bretagne Schuller, explains the medical standpoint on pain and riding, “Cyclists are a very tough breed. They have to dedicate so much of their time to riding a bike as quickly as possible that they are extremely tough mentally. Through training they are able to focus through pain and very little will stop them. If one of our riders is injured at a race the first thing they will try to do, if a stage race, is finish. Then when back at the hotel we assess their injuries and chat about whether they should or should not continue. Sometimes it is a simple process of seeing how they are in the morning, many times a good night’s sleep will see them either feeling better or the full extent of their injuries will become apparent. We also take into consideration where they are in the season, what the event is that they are racing and what races are coming up. Naturally it does not make sense to continue if you are going to cause further injuries or prolong the time to recover. But if the rider is taking part in their season objective race then we try to help them as much to continue, if it is wise to do so. We will give them pain killers to aid them whilst riding injured, but nothing which is against the rules naturally! “If the injury takes place in the early season or during training then continuing is not a priority and we advise the riders to stop, speeding up their recovery. To race at a top level you have to be on 100% form, fresh and motivated. 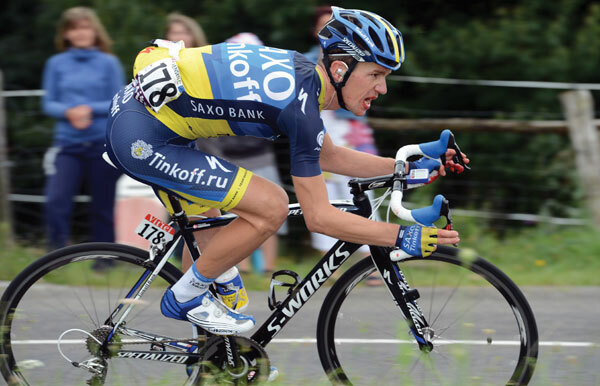 The 2012 Tour de France saw Danish rider for Saxo Bank Tinkoff, Chris Anker Sorensen severely cut his fingers whilst attempting to remove a newspaper which was caught in his front wheel. Being treated on the road he finished the stage with his white bar tape stained red with blood and eventually finished the whole Tour De France. Anker Sorensen explains how and why he did this, “To be honest I am not sure how I continued. The pain was very great and it was quite shocking with all of the blood. Naturally as riders in a team taking part in the biggest race we want to finish the stage for our team mates. That was what I focused on to keep me riding though the pain. It was a simple and stupid accident which even now I am still suffering from. I think that had I stopped I would have healed sooner. By riding on I have had to take a month out. The decision to continue was taken with the team doctor and management. We wanted to protect my position on the General Classification. Since the end of the race I have had to limit my training because of the pain and I am still experiencing pain now, though a lot less. Like when we train, finding the balance between when to push through pain and when to listen to our bodies and rest is a fine line. It is clear from Doctors and riders alike that it makes sense to listen to our bodies. If we experience a pain which is very strong and not normal for riding a bike, then listening to this pain and climbing off of the bike is always the best course of action. Anker Sorensen also ended, “If I did not have an experienced doctor who I trusted to tell me that it was ok to continue I would not; for those who do not have this medical support they should stop straight away. Us professionals are not good examples, we dedicate our whole lives to riding so sometimes do not make the best decision and continue, many times turning a small injury into something worse, fatiguing our bodies more and increasing the time it take to recover. The old and renowned mantra of hardening up when riding a bike is good for when you are pushing yourself past your limits, but has to used with great caution when injured. Many times a short period of hardening up and riding through the pain will result in a much longer period to recover and potentially long term complications. There’s a point when you just have to stop. German sprinter Marcel Kittel was identified as a man to beat in what was his Tour de France debut this year but was forced to abandon during the fifth stage with stomach problems and a knee ailment. Suffering is part the sport but Kittel is of a young generation insisting listening to your body is paramount to health and safety. During the Tour, the 24-year-old took gels supplied by the team and basic pain relief for his knee. However, like some of his contemporaries, he doesn’t agree with taking medication like Tramadol – an analgesic that is legal but can have side effects including drowsiness and dependency. “It was clear to me after a while that I couldn’t continue in that race,” Kittel said. Kittel’s comments come after American Taylor Phinney, in an interview with VeloNation, revealed the common use of “finish bottles” – bidons of crushed caffeine pills and painkillers, which he speculates jeopardise safety. “That stuff can make you pretty loopy, and that is why I have never tried it. I don’t even want to try it as I feel it’s dangerous,” Phinney said in the interview. The resounding message from pro cycling’s emerging stars is simple: if you need to take such strong pain relief to effectively mask a symptom don’t compete. “If you wake up with a fever and you need to take some sort of painkillers to be racing, then you probably shouldn’t be racing in the first place and your team doctor should be worried about your health and send you home,” Phinney said. Central to the issue is identifying levels of pain. Tony Martin described the final kilometres of his world time trial title defence this year as the hardest of his career. He pushed the barrier, fighting searing lactic acid build-up on the Cauberg to win gold. Goals motivate riders to keep going but you also have to know your limits on any given day. Martin fractured his hand during the first road stage of the Tour but kept riding on to stage nine – a time-trial – after which he withdrew. “Please,” he said to his sports director who then understood. In Kittel’s words, it didn’t make sense to continue.